The Connecticut Law Enforcement Officer's Memorial Run is a chip-timed 5K race, certified by USA Track & Field. The single-loop street course runs the area near the Wadsworth Mansion (starting and finishing at the mansion) and features rolling hills. The course will be marked with roadside signs to indicate direction; please watch for these advisories. Middletown Police Department will be providing traffic control however participants should stay alert for vehicles. Refreshments will be provided after the race. No water stations will be set up on the course, please hydrate accordingly. Restrooms will be located at the rear of the parking lot to the right of the Wadsworth Mansion. Click the button to the right to download a copy of the course map (PDF). 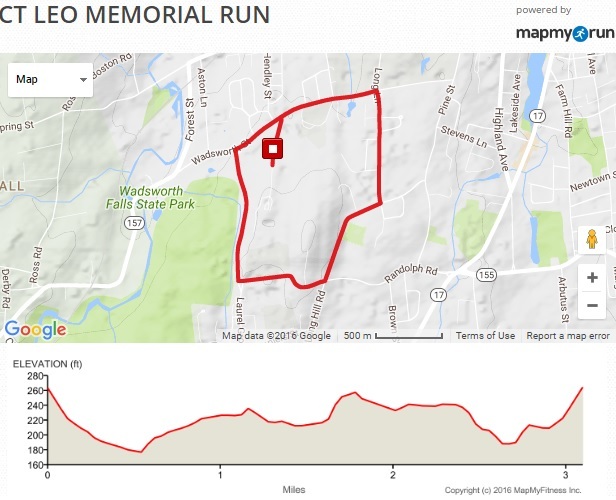 Below you will find a map of the area along with the course elevation courtesy of Map My Run. Keep up-to-date with the weather conditions in Middletown, CT via Weather Underground. Make sure to dress accordingly as the race will be held hot or cold, rain or shine!